After the feeding frenzy of the first 24 hours following the news of Alberto Contador‘s provisional suspension by the UCI – and the deluge of evidence, counter-evidence and wild theorising that accompanied it – the flow of news from the mainstream media has slowed to a barely noticeable trickle. In reality, it will probably be some time now before we see significant progress from the ensuing investigations, but as ever there are several well-informed sources in the blogosphere who have kept the debate alive with a combination of fact and informed opinion which casts far greater light on the affair for those who are interested in the detail behind the sensationalist headlines. I have provided some relevant (and highly recommended) links at the end of this post, but the bottom line is this: regardless of the truth of the situation – and every new bit of news that emerges makes things look bleaker still – the credibility of the three-time Tour de France winner is probably already damaged beyond repair. It seems ludicrous to me that the UCI has effectively assumed the dual role of prosecution and defence – or at least this is how it appears from the outside. Why did UCI president Pat McQuaid instruct Contador to remain silent about the test result? At best, it was a ham-fisted attempt at PR damage limitation by the UCI. At worst, it smacks of a conspiracy to cover up the truth. If the story was not on the point of being broken by L’Équipe and German journalist Hans Joachim Seppelt, would Contador and the UCI have ever gone public? And how many other positive tests from leading riders have been covered up like this in the past, for fear of damaging the sport? Why is there no lower limit for clenbuterol levels to allow for cases of small-scale, accidental consumption which provides no significant physical benefit? The UCI is surely now compelled to suspend Contador, even if the trace reading is genuinely a result of contaminated meat (although they could always reduce the length of the suspension in mitigation). The authorities seem to have created a rod for their own back here. Earlier this year, the Court of Arbitration for Sport accepted the explanation of American swimmer Jessica Hardy that she had inadvertently taken a contaminated food supplement, and refused WADA‘s request to extend her ban from one to two years. However, given that ignorance of the presence or source of a banned substance is generally not considered an acceptable defence in such cases, how will the UCI justify anything less than a one-year ban? Now that he has been officially suspended (albeit provisionally) by the UCI, the burden sits with Contador to clear his name. Six weeks after he was originally informed of the offence, we have seen claims and expert scientific testimony from the Contador camp, but no actual evidence other than his word. It doesn’t look good. I have heard the situation described as being that there will never be enough evidence to convince those who believe in Contador, whereas there is already more than enough for those who have always been convinced of his guilt. It’s an apt summary, and the majority of people generally fall firmly on one side of the fence or the other. Having spent much of the last four days reading everything I can on a subject about which I can only claim a little knowledge – which, as the saying goes, is a dangerous thing – I find myself somewhere between the two extremes, but leaning increasingly towards the side of the doubters. I am prepared to grant Contador the presumption of innocence, but recognise that his defence is somewhat flimsy and unconvincing – plausible, yes; credible, not so much. Pickering: Can you assure us that you’ve never taken any banned performance-enhancing products, nor used any banned methods, and can you take this opportunity to make a strong statement for clean cycling? 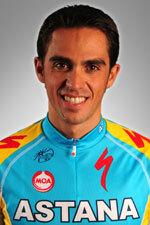 Contador: I’m available 365 days a year, which is something I accept with good grace for the sport I love. I will continue to have this attitude. And then there is his involvement in Operación Puerto. Yes, he was quickly cleared by a Spanish court, but the fact remains the initials ‘AC’ do appear in paperwork seized in the investigation, and given what often appears to be a diffident attitude towards doping from the Spanish authorities, one has to wonder about what really happened here, particularly in the context of a heavy weight of circumstantial evidence elsewhere. I don’t think it is exaggerating too much to say that this is an extremely complex case, and while I am 100% in support of Contador being treated in exactly the same way as Joe No-Name, I fear for the ongoing credibility of the sport, particularly if the UCI cannot categorically demonstrate that they are whiter than white. There are few things worse than a corrupt policeman. I was tested 200 times during my career, and 100 times I had drugs in my body. I was caught, but 99 other times I wasn’t. Riders think they can get away with doping because most of the time they do. Even if there is a new test for blood doping, I’m not even sure it will scare riders into stopping. The problem is just that bad. As if I haven’t already painted enough of a doomsday scenario, to make matters worse the New York Times is now also reporting that Contador failed a second test at the Tour the day before testing positive for clenbuterol, registering eight times the legal limit for a plasticizer commonly found in blood bags. The allegation had already been raised by L’Équipe last week, but this is the first time it has been reported that the test result came from a different sample. The testing process involved is new and has not yet been approved by WADA, so the positive test is almost certainly inadmissible as evidence. However, it adds to the collateral damage to Contador’s reputation which is rapidly moving towards the point of no return as far as the court of public opinion is concerned. Things are not looking good for the Spaniard. Even if Contador is fully exonerated and the UCI are shown to have acted with the relevant propriety – hey, look, airborne bacon! – the reality is that there has already been more than enough doubt cast over the integrity of both that all but the most blinkered optimists must realise that the events of the last week will continue to drive casual fans away from one of the most physical challenging sports there is, a sport I love. According to Contador’s Wikipedia entry, he enjoys hunting in his spare time. The shoe is very much on the other foot right now. Excellent summary and thanks for the links. This story is receiving little coverage in Australia. It’s not looking good for Contador is it? The UCI’s role in this is equally reprehensible and makes Landis’s accusations about the UCI cover up of Armstrong’s alleged positive look more plausible. As it stands, I’m not sure how he can escape with less than a year’s ban for the clenbuterol positive, and the opprobrium of cycling fandom in general for the plasticizer test. We’ll just have to wait and see how this plays out over the coming weeks and months, but it certainly doesn’t look good. ITV’s Ned Boulting pointed out on Twitter that the 2011 Tour route presentation takes place on the 19th, and that it is customary for the defending champion to be there – wonder if Contador will turn up, or be allowed to turn up? I agree with your thoughts about Landis/Armstrong, sadly. No proof, obviously, but certainly more (contaminated?) food for thought. Bernhard Kohl’s presentation at the USADA conference also made for depressing reading, but we can’t just stick our heads in the sand and ignore him. The sport still has a trouble with doping, despite all the investment in testing regimes. The fundamental problem is that there will always be a lag between a new drug coming out and the development of a test to detect it that WADA are happy with. It simply isn’t possible for the testers to be ahead of the game. First of all thanks for commenting on my piece . I concur with what you’re saying but by my way of thinking until UCI , L’Equipe clean up the sport of cycling and are prepared to work conclusively and exclusively with WADA then we’ll continue to see the sport dragged through the mud. Personally it’s my belief that the boldest move that can be made is for the IOC to drop the sport from the Olympics and not allow it back in until they make the move to clean it up once and for all. It’s bad enough that everyone becomes suspicious of the results of the Tour De France at the culmination of the event. Cycling certainly needs to clean up its act, but I think dropping it from the Olympics is a bit extreme – not least because the Olympics aren’t particularly important in road cycling terms – the three Grand Tours, the Worlds, arguably even the big Classics like Paris-Roubaix are all more important than the Olympics. Also, where do you stop? Athletics is equally plagued by doping problems, but there is no way the IOC would ever drop its centrepiece sport from the Olympics. For sure, the UCI needs to keep working even more tightly with WADA, ASO (the Tour and Vuelta organisers), USADA and pretty much everyone else involved in trying to clean up the sport. But now is not the time to run away and hide. It’s not a matter of hiding but making an example of that particular sports as the IOC did with baseball. That was one of the reasons why it was dropped from the games as the MLB hierarchy (stateside) was unwilling to comply with the IOC . Things didn’t change until the US Congress started their hearings. The int’l governing body of the sport pleaded implicitly with the officials here in the US but to no avail. Correct me if I’m wrong, but my understanding is that it is has never been confirmed exactly why the IOC dropped baseball from the Summer Olympics. One of the most commonly reported rumours was MLB’s refusal to suspend the season for the Olympics, and also its less-than-brilliant record with dealing with drugs offenders – but the latter accusation could also be levelled at many other sports too. It was also said that there was a pro-European/anti-US bias behind the decision, that the Olympics could never compete with the World Series for prestige, and that many saw it as never being more than a fringe Olympic sport which put an unnecessary logistical strain on host cities. In the greater scheme of things, baseball was a pretty minor sport at the Olympics – part of the full Games only five times and with only 8 countries competing at each of those five Games. And, in most countries, receiving little or no airtime too. It was not a great loss, really. Road cycling would be a big loss – it is a long-established event at the Olympics, and although it is less important than the Grand Tours and the Worlds, it is still a sport which garners significant fan and TV attention, I suspect the only people the IOC would end up punishing by dropping cycling from the Games would be themselves. Amongst the problems that came about from MLB hierarchy’s stance was their not willing to adopt a policy in line with WADA testing policy . It has been reportedly widely here but Selig as commissioner didn’t want to address the reasons even after the Int’l Baseball Federation met with him to ask him reconsider. Much of it however had to do with the MLBPA (players’ union) and their widespread power and the fact that they had Selig eating out of their hands. It may not be a great loss but its significance and the fact that as a sporting spectacle in terms of revenues it far exceeds that of cycling on an international scale. And that the end of the day it’s about money . Competitive cycling and its ancillary extended spin-offs isn’t a multi billion dollar business whereas baseball is. One of the real problem baseball faces is that on the organizational front it does a poor job of promoting the sport globally. UCI while it does a great job promoting the port they simply haven’t gone far enough in trying to clean it up . And unless they do so I see no reason to even take the sport seriously !